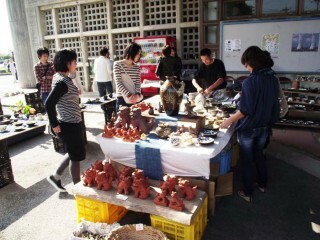 People shop for handicrafts from Ogimi. The art of creating ‘Bashofu’, a cloth using fibers of banana leaves, is at the center of the 10th Ogimi Village Crafts Exhibition opening Friday, April 5th for three days. This exhibition, which takes place at the Ogimi Farm Village Environmental Improvement Center, and at the Ogimi Village Bashofu Hall, is a part of Ogimi industrial festival which is organized for activation of Ogimi village. The exhibition is open each day 10 a.m. ~ 6 p.m., although Bashofu Hall will close at 5 p.m. Admission is free. This exhibition prepares showcases craftsmen’s work, and has visitors use handmade handicrafts widely in everyday life. Many works, which make people’s life easier will be exhibited. 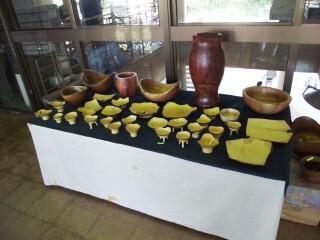 Ogimi produces plenty of handicrafts like these wooden vessels. time using tableware, a lights, and other items. which the craftsmen have sent to this exhibition for display. An exhibition and sale of bashofu, the cloth made using fibers from Japanese banana leaves will be held in Ogimi Village Bashofu Hall.